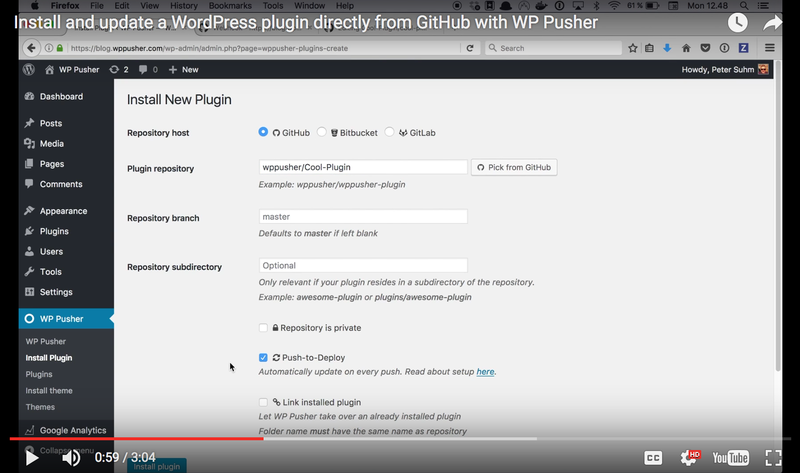 The ultimate guide to WordPress Git workflows. 100% free course by WP Pusher. The git init command is the first command you will use in any Git project. It is probably one of the commands you will use the least, unless you are starting new projects all the time. The git branch command is used to manage your different branches. That mostly means creating them, jumping between them and delete them. It is not the most exciting command. This is where we rewrite history! Literally. Git rebase can be a bit intimidating, especially on large rebases. However, conceptually it is a pretty simple command. With the rebase command, you can rebase your branch on another branch to include commits that were added after they split. The git tag command is a simple way to save specific points in history by tagging them with a name that is easier to refer to later on. This command is what GitHub uses behind the scenes when you use the release feature on their platform. In this lesson we will dive into the .gitignore file that you can keep in your repository to instruct Git to ignore certain files. This is super useful in order to avoid keeping other people’s code in your repository.